Travelling around Lake Geneva? 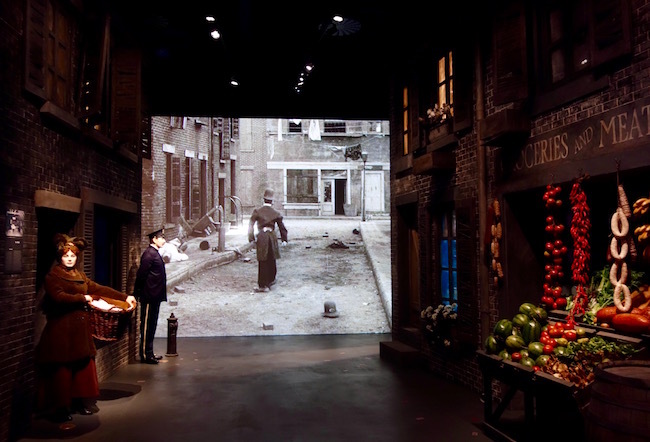 Visit Switzerland’s newest attraction, Chaplin’s World, an interactive Chaplin museum in Vevey. 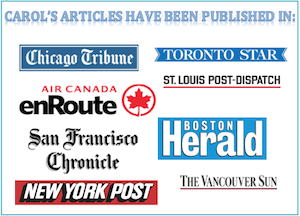 For all the travel facts you’ll need, scroll down to the fact box below. For my experience, read on. “A day without laughter is a day wasted,” says a big Chaplin quote on the wall of the gift shop of Chaplin’s World, the new Charlie Chaplin Museum in Vevey, Switzerland. Oh, no! I bit my lip. I probably haven’t laughed in four days. Travelling alone will do that to you, especially if you don’t want people to move away from you on the train. Was I wasting my vacation? It wasn’t the best way to start my tour of the museum, which is only a few days old. (Whoot! I was one of the first to see it). As I stood around a wee bit glumly (also somewhat confused about where to start), a staffer at the ticket entrance told me I should go to the Studio as the ‘Spectacle,’ a 10-minute film, was going to run shortly and it was the last one of the day. “Is the ‘spectacle’ just clips of Chaplin’s films or is it a film about him?” I asked. The problem was I hadn’t given myself enough time. Chaplin’s World should be taken at a leisurely pace, with a 20-minute stroll through the tranquil grounds of his estate in Corsier-sur-Vevey; a sentimental tour of his white-and-green neoclassical home, the Manoir de Ban; and a visit to the Hollywood-style Studio. I, however, had a train to catch and was thinking of skipping the Chaplin Studio altogether, especially if the ‘Spectacle’ was just going to be movie clips. After all I could always watch Chaplin movies at home. 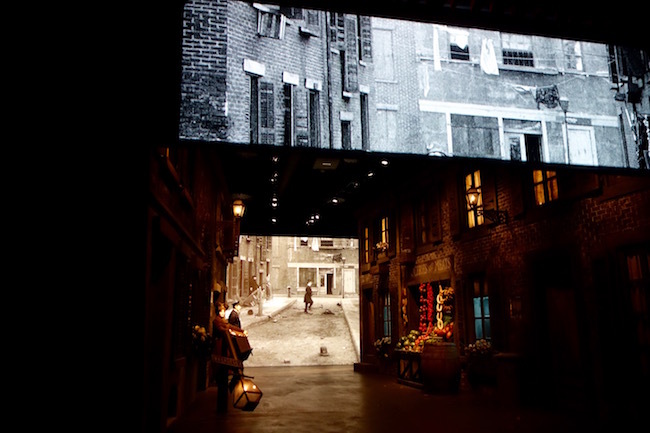 Important note to those wanting to visit Chaplin’s World – DO NOT SKIP THE STUDIO. The staffer didn’t understand my question. This was for the best as it would have sounded almost sacrilegious asking someone at the brand new Chaplin Museum in Vevey if they were just showing Chaplin movie clips. 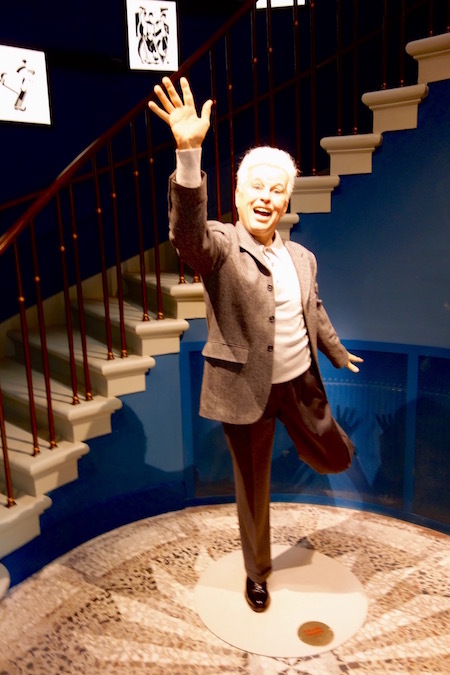 Chaplin’s World was 15 long years in the making, and it’s dedicated heart, soul and belly laughs to this much-beloved comedian who, for 25 years, made his home here high on a hill overlooking the shores of Lake Geneva. It’s only 10 minutes out of my life, I told myself, heading into the theatre as the lights dimmed and Chaplin started spouting off as Hitler. Within seconds I burst out laughing as the scene switched and he kicked a man in the pants. I laughed again when a monkey jumped on his face. 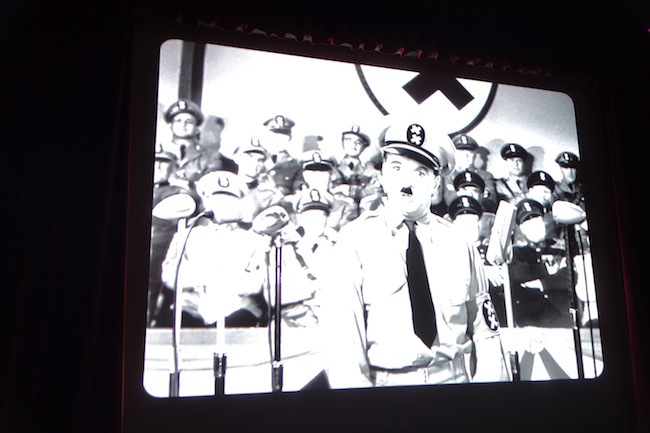 I even laughed at a war scene – and if Charlie Chaplin can make you laugh about war, he can make you laugh at anything. Yes, I got teary. Twice! Once at another scene about the war, a real scene this time with Chaplin speaking (as himself), and then again when news clips were shown of him getting barred from the United States as a suspected communist sympathizer. That’s a lot of emotion in 10 minutes, and there was nothing ‘just‘ about it. Now I don’t want to spoil your surprise, except I’m going to, so if you don’t want to know what happens in this brand new recreated Studio I’m giving you a spoiler alert right now. Okay, you asked for it. After the film ends the screen lifts up and suddenly you’re walking into an entire universe of Charlie Chaplin, like really walking through his streets and film sets and movie reels and multi-media displays and half the time you don’t know if the dummies you’re passing are real or fake. Something was bothering me though. It was Chaplin’s quote about how a day without laughter is a day wasted. 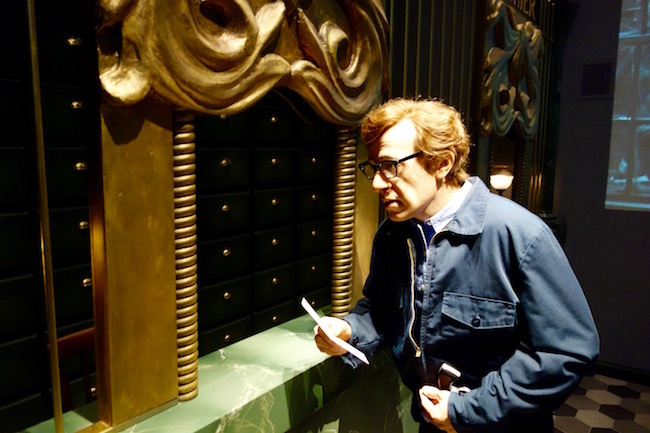 By my calculations I’d laughed 3 times in the ‘Spectacle,’ but before that I hadn’t laughed in at least four days. If I wanted to catch up I’d need to laugh at least one more time. But it was too late, the spectacle was over. Oh, well, I thought. 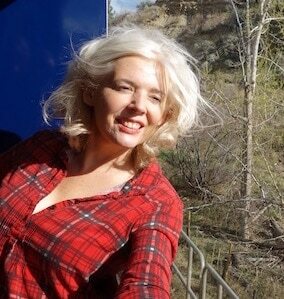 Maybe some local Swiss person will tell me a joke on the bus back. 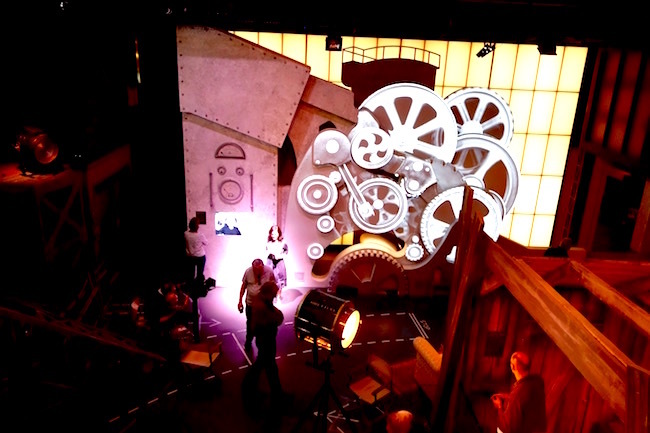 Resigned, I wandered through the maze of recreated film sets, my eyes whipping back and forth and practically around my head as I tried to take everything in. I passed the replica restaurant of the one Chaplin ate in in The Immigrant; the barber shop from The Great Dictator, and a jail set where a serious-looking group of Chaplin devotees were watching a film screen. The path led me into a small prison cell. Through the bars I could look out onto the backs of the Chaplin fans watching the screen on the wall. See the screen on the right? That’s where the fans were watching. See the bars on the left? No one shrieked (like I was hoping for) but they all swivelled around in a hurry. Ha ha! If I could steal a scene from Charlie Chaplin even for a nanosecond my journey was complete – and I laughed (at least inwardly) all the way to the bus. It’s said Michael Jackson got the idea of Moonwalking from Charlie Chaplin, who he called his inspiration. Decide for yourself in this hilarious YouTube video. So? What did you think? 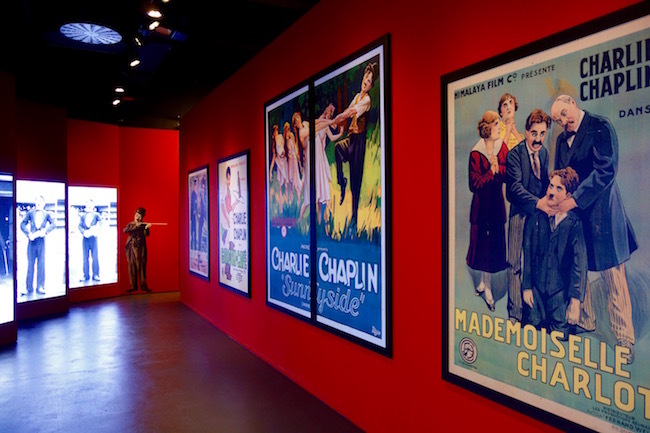 Don’t you want to visit the Chaplin museum in Vevey now? Or at least watch a Chaplin film? And now on to the necessary, how to’s. How do you get to Chaplin’s World? First you have to get to the town of Vevey. 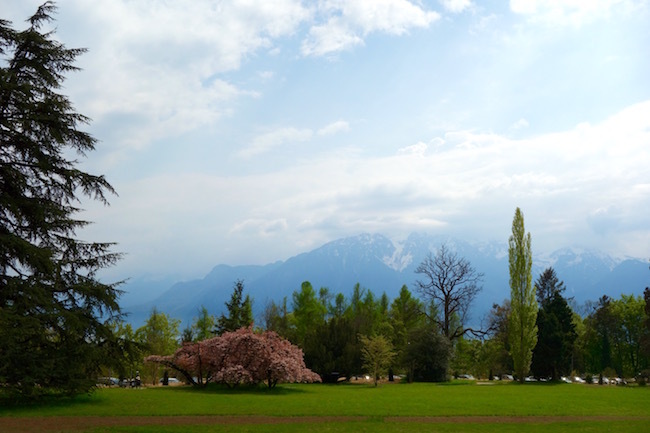 Trains run frequently from Geneva, Lausanne (about 25 km away, less than half hour by train) and from nearby Montreux. Once there take bus 212 (destination Fenil) to Corsier-sur-Vevey from either the Place Marche down by the lake or from a bus station in front of Vevey Gare (the train station). Ask around, the stop can be a little hard to find. Get off at the Chaplin bus stop. The bus goes to the Chaplin’s World every half an hour. From Place Marche it leaves at 8 minutes past the hour and at 38 minutes past the hour. From the train station a couple of minutes later. The bus stop back to go back to Vevey is right across the street from Chaplin’s World and returns every 7 minutes past the hour and every 37 minutes. By foot: It’s a long uphill walk but possible. About 3 km (about 40 minutes). Get directions from the Vevey Tourist Information Centre in the Place Marche. 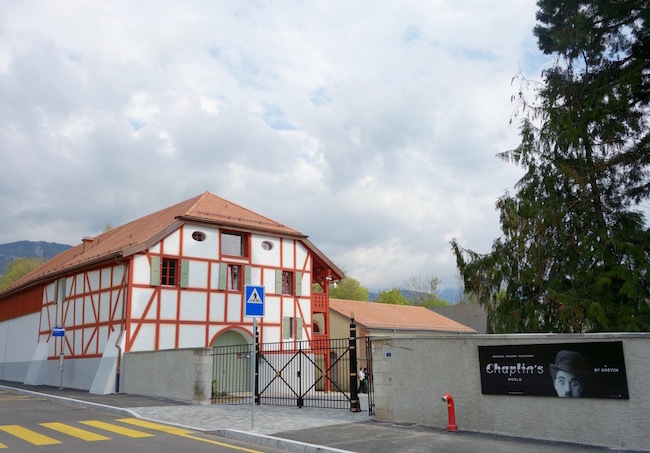 The Chaplin museum is at Route de Fenil 2, 1804 Corsier-sur-Vevey. Chaplin’s World is open every day except New Years and Christmas from 10 a.m. to 6 p.m. Adults 23 CHF (Swiss Frances, which is about equal to 23 USD) ; Children 17 CHF; Age 6 and under free. Family ticket 68 CHF. If you have a Montreux Riviera Card Adults are 11.50, Children 8.50. You can buy tickets online or at the door. 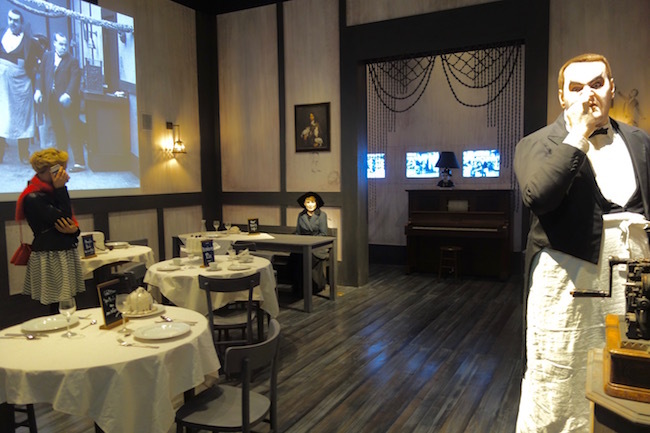 How much time do you need at the Chaplin’s World Museum? Give yourself 2 hours, there really is a lot to see. Manoir de Ban: As fun and crazy as the Studio is, Charlie Chaplin’s home, where he lived for so many years with his 4th wife Oona and their 8 children is a sentimental journey through a place he lived, loved and created. Studio: Well, I’ve pretty much told you about this. Boutique: Don’t you want to take home a Charlie Chaplin bowler hat? Or perhaps a cane? Why not wear it on the bus ride back to Vevey? I dare you. Make someone laugh so their life isn’t a waste. Restaurant: The Tramp restaurant is a brasserie-style restaurant with s Chaplin-esque atmosphere. A certificate signed by Queen Elizabeth II when Chaplin was knighted in 1975. Take that United States McCarthy-era paranoia! What were you thinking not allowing Chaplin back into the USA in 1952? FYI: Chaplin didn’t return to the USA until 1972, when he received an honorary Academy Award. Look for his iconic bowler hat and cane from his Little Tramp era in the Studio. For more information on visiting the Chaplin Museum visit the website. PS: I liked Chaplin’s Museum so much I went back the next day (partly because I’d forgotten to bring my camera the first time) and laughed at least twice more, so now I’m a laugh ahead. For more info on travelling in Switzerland visit the Switzerland Tourism website. And thanks to the Swiss Travel System for providing me with a rail pass so I could tour around and, as luck would have it, be one of the first people to visit the Chaplin Museum in Vevey. 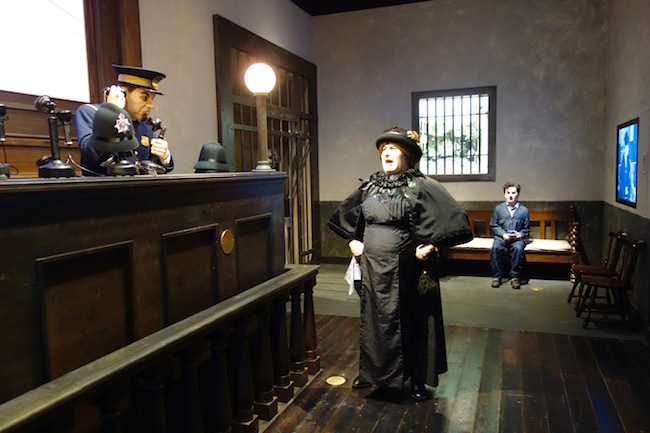 All opinions and jail-cell reenactments are my own. Sightseeing around Lake Geneva? Visit the Chateau de Chillon, Switzerland’s most famous castle. Love Europe? Read my Where to Go in Europe blog post. Fantastic. Really it is a good work and it is explaining the glamour and hard work of chaplin the great. Hi Marija, I’m glad you found the Chaplin in Vevey article helpful. 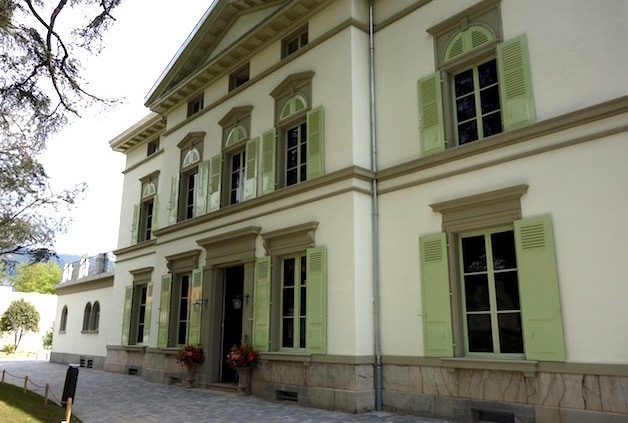 Yes, the Chaplin museum and house are next to each other on the grounds of his former estate. The museum itself is a very modern experience in his former studio, and you can also see the historical home where he lived. Enjoy your trip to Vevey. Incredible! Beautiful! Congratulations! I’d wanted to visit the house and museum, and for a long time researching about it, so thank you very much for this story, really helped me! I just want to ask you whether the house and museum are located next to each other? Is it all around? Yet these are not the same things, right? What an interesting side trip! Vevey looks like such a lovely town. This might be a nice pitstop on a road trip! There any good dining options nearby? Thanks for sharing this, Carol! Cool how there are so many varied offerings out there! More power to you! “A day without laughter is a day wasted”…100% Agree. Great motto to live by!!! From what I saw as a very young child, I do remember laughing… He was great! I definitely want to watch some of his movies now. I loved the moon walk video and the house and grounds look beautiful. I didn’t know he lived in Switzerland or was a suspected communist sympathizer or anything so thanks Carol. I’d love to go to Vevey every year. What a way to grow up, Fiona! Gosh, I used to go to Vevey every year. Charlie chaplin was actually born near where I live so I really will have to visit some time. Wonderful to see this tribute to the genius Charlie Chaplin. The moonwalk video is pretty cool, too. Thanks for sharing it. I can see why you would need a couple of hours to fully explore the place–it looks like there is a ton to see! I would love to check it out sometime. Charlie Chaplin is always a good laugh and it would be great to see the sets and the estate. Thanks for sharing–I’ll have to plan a visit there someday! 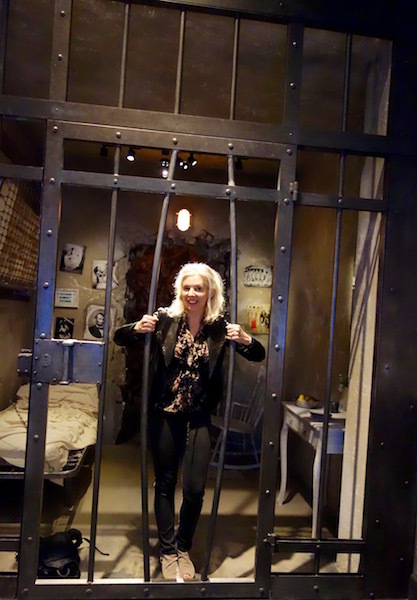 I love that you had an amazing time there, and I love that picture of you behind bars! :) Sounds like an awesome museum!! Sounds like just what you needed! I love when in our travels even if we feel down that something small can bring it all around! Loved reading more about Charlie Chaplin – I’ve never read much about him. I haven’t seen much of Charlie Chaplin’s movies but I remember my parents telling me how funny he is. Sounds like I should track some down and make time to watch them with the kids. There had been talks for years, and in various cities, Brianna. It was bound to happen somewhere. I’m surprised there hasn’t been a museum dedicated to Chaplin before. Definitely one of the best comedians to have ever lived. I haven’t seen too much of Charlie Chaplin’s work but I now want to. It sounds like he was an incredible and fascinating person. So cool about Michael Jackson’s moonwalk.